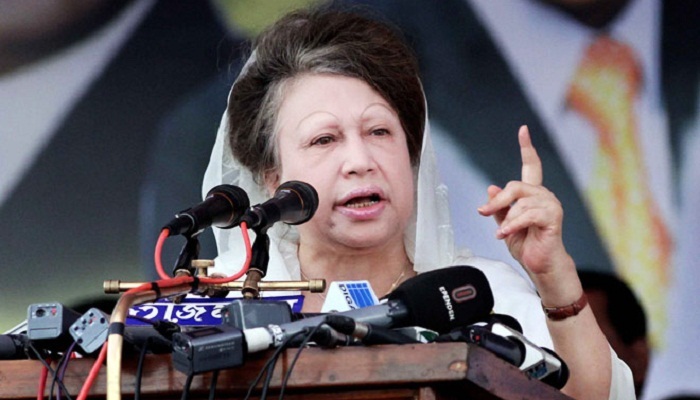 Accusing the ruling party of carrying out propaganda in the name of election survey, BNP chairperson Khaleda Zia on Sunday said the ruling party will face a debacle in the December-30 municipal election if it is held fairly. Speaking at a programme of a group of journalists, she again claimed that her party candidates will get 80 percent votes as the voters are waiting to cast their ballots in favour of sheaf of paddy, the election symbol of BNP, reports UNB. “Conducting any false election survey will be of no use. I myself know what the findings of the survey are. The true results suggest their (AL’s) debacle. But, they’re carrying out a false campaign only to legitimise their corruption,” Khaleda told the programme held at the Supreme Court Bar Association auditorium. The BNP chief also urged the voters to go to their respective polling stations to exercise their franchise in a festive mood on the voting day.